It's vendange time in the Hautes-Pyrénées. Our neighbours invited us to help in a tradition as old as the hills. 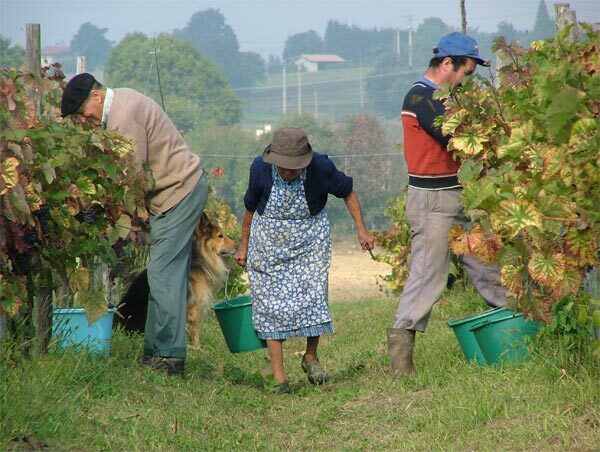 Madame Deffis works alongside her sons, just as she did with her grandfather. squeezing the last drops out, while Maman looks on. "Keep sawing Bonks, he's got the camera out!" 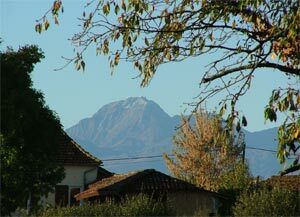 Le Pic du Midi, seen from our garden. 50 kms away and the first signs of snow are appearing. We like the odd drop of Madiran wine. 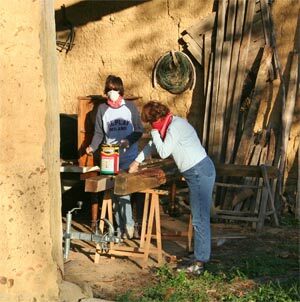 Caroline and Marianne treating the beams for under the stairs with Xylophene while trying to get a tan. Yes, it is very toxic! 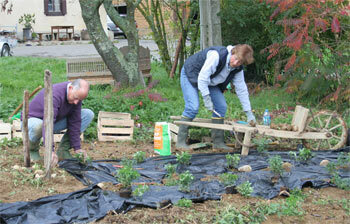 Peter and Marianne paying their keep by bedding 250 plants around the pond. 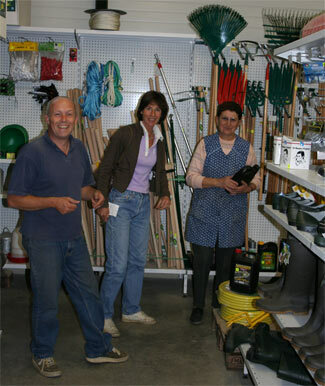 BricoTrie, our favourite hardware store. They have everything and even fixed the door to our wood burner. We were told that the vendange had begun. 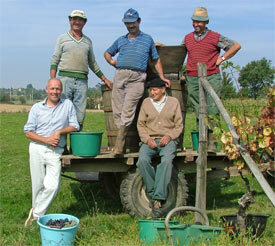 A little further down the hill, our neighbours, the Deffis family were busy working along the rows of vines. We introduced ourselves and asked if we might help. The next few hours were a joy, chatting through the leaves as we cut and dropped the bunches of red and white grapes into buckets. They had a small press and vat on the back of the tractor, where we emptied the fruits of our labours. 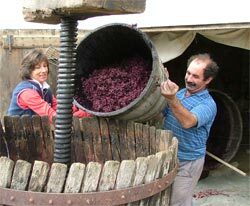 They were very happy to make our aquaintance and gave us a bag of grapes and a bottle of Bourret, the first juice from the freshly pressed grapes. A week later, we were invited to see the second pressing. 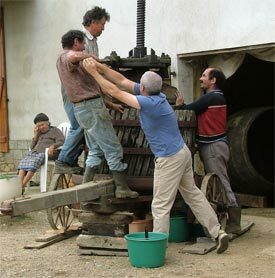 A simple, century-old press had been set up before the house. 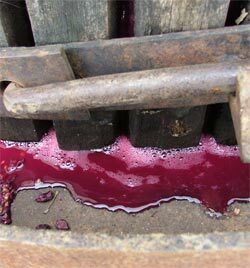 After transfering the grapes to the press, heavy oak blocks were placed on top and the vice slowly brought down. It was easy at first, but the resistance built up as we winched it down further. The resulting juice was transfered to large vats in the chai. As a thank you, we received a bottle of last year's wine which we drank with roast duck. It tasted all the better for us having been a small part in the process. If you'd like to try some of the wines of our region, you should look out for the following: RED, Madiran and Saint Mont. Less tanin than a Bordeaux or Cahors. WHITE, Tariquet. Our favourite white wine for most occasions. 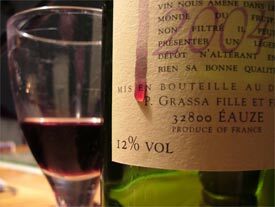 Then you have Pacherenc which is a sublime, sweet wine that the Gascons drink with their foie gras. Then you have Armagnac. The best come from the Bas-Armagnac region. The older it gets, the smoother it becomes, and the more expensive. Caroline's best friend Ylonka (known as La Bonks) came for a long weekend. We asked her to be our guinea pig and try the navette (shuttle bus) from Toulouse airport to the station and a train to Lannemezan, instead of us doing a 4 hour round trip with the car. It all went rather well and she pitched in to help around the house in between sunbathing sessions. On the Sunday, we visited a vide grenier (attic clearance market) in Tournay. On the way back, we saw a huge chestnut tree. Ten minutes later we had three and a half kilos of the brown beauties in the wicker basket Caroline had just bought at the market. The next day the girls peeled, cooked and mashed them with a vanilla pod into a spectacular jam. The air here is so clear. Over the last few months we have seen the Pyrénées in their glory. The best time is early in the morning when the sun still hits our side of the mountains. The snow has been slowly building up and the skiers will be able to hit the pistes in a few weeks. Perry has been extremely busy the last few months. The brochure for Austyn's Cornish Cottage Holiday company was sent to the printers and is now dropping on doormats around the British Isles. If you'd like to eat a cornish pastie walking along beautiful, people-free beaches, check this out. We now use the back of the house to store our wine, food and preserves, being cool and dark. The 500 litre wine vat that was left in our chai will always stay there as a reminder of how the house once was used. Some may say that because the chai is becoming Perry's studio, that the vat is perfectly placed. Caroline's parents, Marianne and Peter, arrived for two generous weeks. They brought the French comtoise clock Perry had bought in Amsterdam for Caroline's birthday. As usual their car was full of bikes, books and goodies from Holland. Their visits always put a huge impetus in our efforts and we sailed through a vast amount of DIY jobs (klusjes) during their stay. You can hear them for miles, echoing out of the valley. 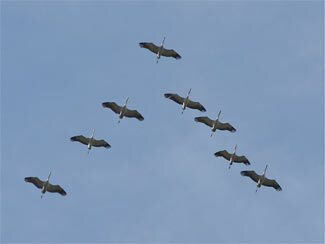 Grey cranes, on their way from Eastern Europe to Africa, stopping off at the lake of Puydarrieux. We took the bikes and binoculars to find them and we weren't disappointed. 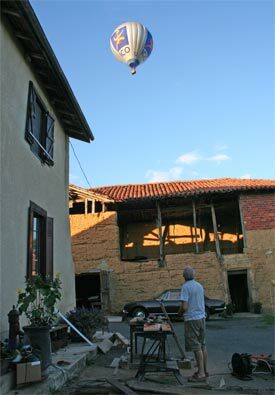 One day while we were working outside, a hot air balloon drifted over the house. Such a beautiful sight against the clear blue sky. And so silent, we could hear the passengers chatting in their basket. We are always in need of new screws, nails, chisels, saw blades, etc, etc. Our favourite place is the BricoTrie, a family run store. They are always very helpful and always making jokes. The last time we were there, we gathered quite a pile of goods on the counter. Caroline cheekily suggested that considering the amount we were buying that we should get a free bottle of wine (yes, they sell that too, as well as hunting ammunition). That evening we enjoyed the wine with our dinner.